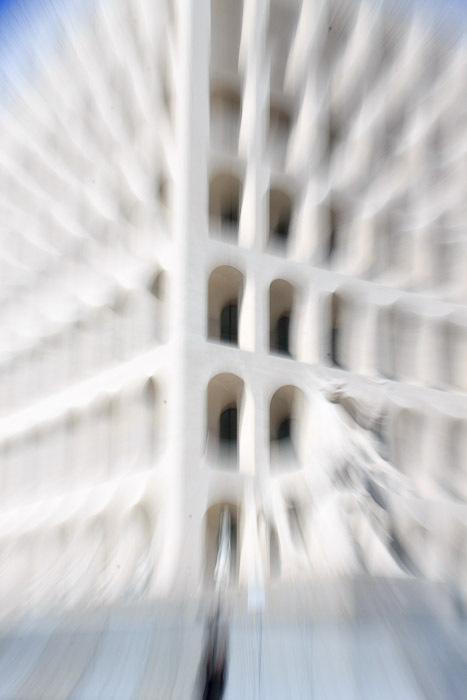 The Palace of Labor is a large white cube-shaped building with an exterior containing 54 arches per side, patterned to copy the Colosseum, and nicknamed the "Square Colosseum", or, less often, the Swiss Cheese Palace. 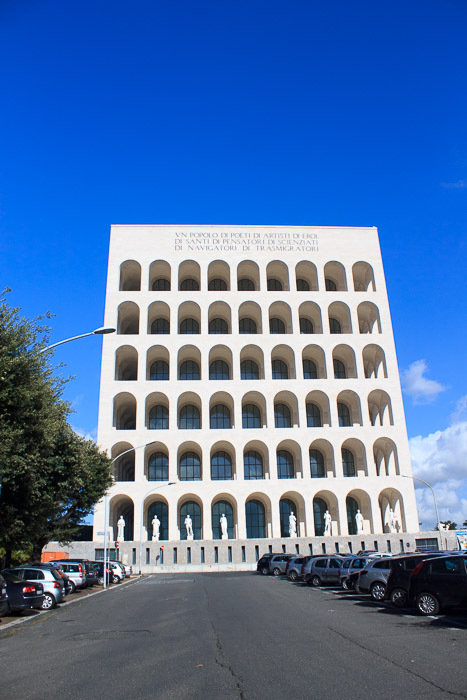 It is an icon of fascist architecture, lying in the EUR district of Rome, near the EUR Magliana metro stop. 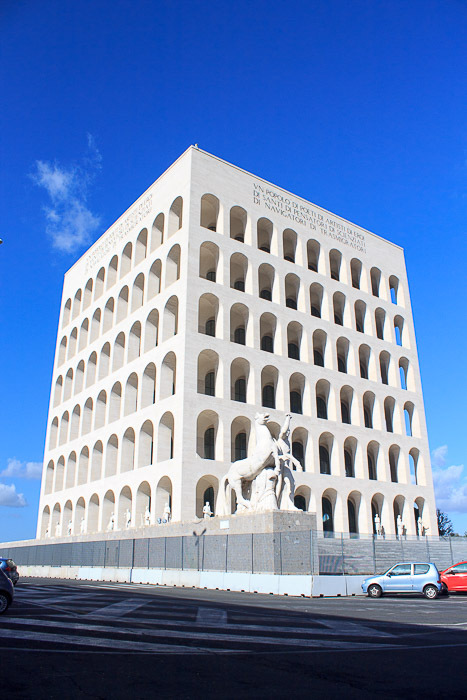 This building, and the entire EUR district, was constructed under the direction of Benito Mussolini from 1935 to 1942 for the planned 1942 world exhibition and as a symbol of fascism for the world. This building is the most iconic in the district. The building was closed to the public for restoration between 2003 and 2008, and from 2015 onward for the next 15 years will house the headquarters of the luxury fashion label Fendi, with the ground floor being left clear to house exhibitions celebrating Italian craftsmanship. This would be a welcome change, since when I visited the building in fall of 2012, a large impenetrable fence surrounded the building, preventing one from getting very close to the building, or even on the steps. But even if it's not accessible, I found it an interesting building to look at and photograph from the outside, and close enough to the Museum of Roman Civilization and the Marconi Obelisk to make the trip worthwhile. 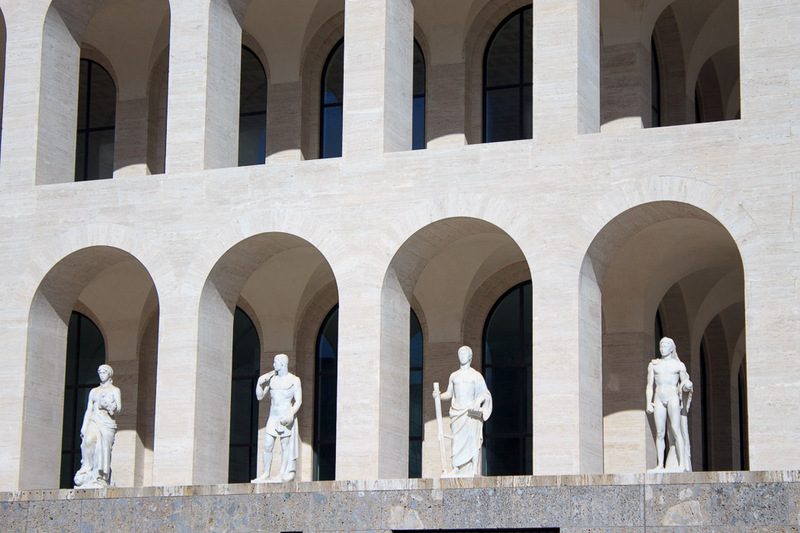 The building was designed to celebrate the Colosseum, and like to the Colosseum its exterior is made of arches. There are 6 rows (floors) of 9 columns per floor, said to be an allusion to the name of Benito (6 letters) Mussolini (9 letters). The building is faced with white travertine marble, as is most of the EUR. At the four corners of the podium it sits upon are four equestrian sculpture groups, representing the Dioscuri (Castor and Pollux). Around the base of the bilding are 28 additional statues, each inside an arch, illustrating various industries and trades. See all Palace of Labor photos.